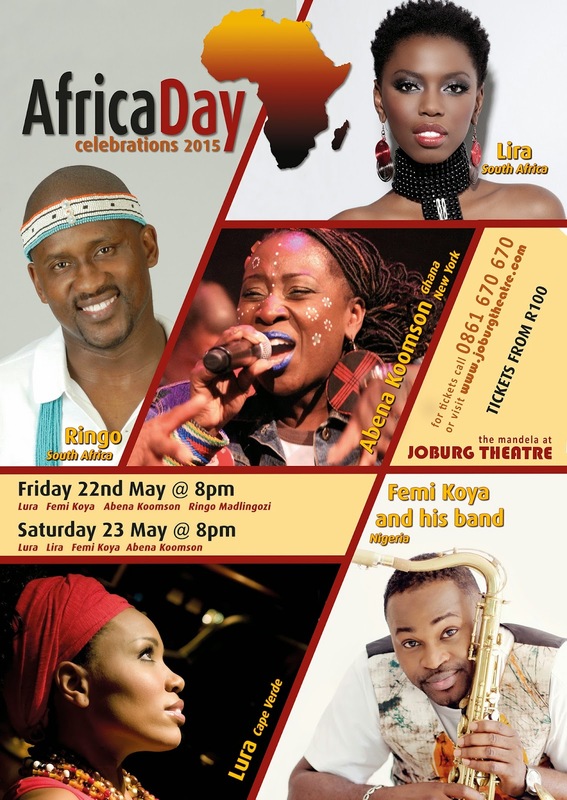 To commemorate Africa Month this May, Joburg Theatre will be presenting a weekend of AFRICA DAY CELEBRATIONS featuring local and international artists on The Mandela stage at Joburg Theatre on May 22nd and 23rd. Friday May 22nd will feature Lura (Cape Verde), Femi Koya and special guest Abena Koomson (Nigeria, SA, Ghana/New York) plus Ringo (SA). Performances are at 8pm on Friday May 22nd and 8pm on Saturday May 23rd. Africa Day celebrates the continent's achievements and affirms its vision to create a better life for all. The vision of the African Union is that of “an integrated, prosperous and peaceful Africa, driven by its own citizens and representing a dynamic force in the global arena. Joburg Theatre will be presenting a special weekend of African music featuring the richness of the continents rhythms, dance and song. A diverse and exciting programme which salutes Africa’s musical heritage, from the inimitable Cape Verde sounds of Lura, to South African musical giants Ringo Madlingozi and Lira, to a special tribute to the great Nigerian Afrobeat Master, Fela Anikulapo Kuti. The Fela Tribute features multi-talented Nigerian saxophonist, Femi Koya, with his 8-piece South African band and special guest Abena Koomson. Ghanaian born, New York-based Abena Koomson is a member of the Tony award-winning Fela! on Broadway show. Headlining the AFRICA DAY CELEBRATIONS at Joburg Theatre is award-winning Ringo Madlingozi and Lira. Both are household names in South Africa who represent the best of Mzansi music. Ringo is one of the biggest artists on the outdoor festival circuit and draws thousands of fans across the age and gender divide, both in South Africa and the continent. Lira continues to make waves both on the local and international stages including Europe and the USA. Moving from South Africa up to the West Coast of Africa is singer and dancer, Lura. Lura is a Portuguese-speaking artiste who stands at the crossroads of the Portuguese and Cabo Verdean culture. This award-winning artiste, who is constantly performing on the international stage, was born in Lisbon to parents of Cape Verde heritage. Lura is signed to Lusafrica, producer of the legendary, Cesaria Evora. Her music is influenced by African Carpo Verde rhythms, jazz, soul and Portuguese pop music. This former swimmer and dancer turned singer, with her beautiful soulful voice, is an exceptional performer on stage. Nigerian multi-talented saxophonist Femi Koya and his South African band features Abena Koomson, a powerful singer and accomplished poet, who hails from Haarlem, New York. Abena, a member from the Tony award-winning Fela! on Broadway show has recently performed with the acclaimed Kronos Quartet – an exploratory string ensemble, who celebrated their 40th birthday at their recent show entitled Afrobeat, Hip-Hop and Kronos Quartet: ‘Red Hot + Fela’ at the Lincoln Centre, New York. The Africa Day weekend celebrations will also host workshops at Joburg Theatre and schools with Abena Koomson. Tickets range from R100 to R200, and are on sale by visiting www.joburgtheatre.com, or by calling the theatre’s ticketing line on 0861 670 670. Discounted rates for groups of ten or more are available by calling Joburg Theatre on (011) 877 6853/6815.